During early 1990s overhauls, ships had the 5" 54 cal guns upgraded to Mk 45 Mod. 1, the Phalanx CIWS systems upgraded to Block 1 and the forecastle deck area strengthened to prevent cracking. Planned armament improvements include deletion of the at-sea reload cranes in the VLS complexes to permit carrying six more missiles and the installation of two 25-mm Mk 38 Bushmaster chain guns in Mk 88 mountings. The number of Mk 137 launchers for the SRBOC system has been doubled to eight (with the system itself now designated Mk 50 vice Mk 36), and the ability to launch Nulka hovering decoys would be added. EHF SATCOM capabilities have been added to take advantage of the latest imagery datalinks, and internal communications systems are being upgraded. Since 1994, ship self-defense capability improvements have been limited to the installation of the Cooperative Engagement Capability (CEC) system on four ships. In 1999, the Navy had assessed the ship self-defense capability of this class as having moderate to high capability against the near-term threat requirement, moderately capability against the mid-term threat requirement, and low capability against the far-term threat requirement. The Navy's representation of the ship self-defense capability of this class may be overstated as it is based on the assumption that the class is being equipped with the Phalanx Block 1A, but as of 30 September 1999, none of these cruisers had this variant. In addition, the assessment was based on these ships being equipped with the SPY-1B. However, only 15 of the 27 cruisers have this radar variant. The Navy expects to modernize this cruiser class initially with the SPQ-9B radar, the AIEWS, CEC, the baseline 6 version of the Aegis combat system, an upgraded RAM, and NULKA. The procurements of these self-defense systems are scheduled to occur in fiscal year 2002, and the installations are scheduled for fiscal year 2004. The Navy has determined that these additions would provide high self-defense capability against both the near- and mid-term threat requirements, and moderate capability against the far-term threat requirement. Some 17 units of the class are to be fitted with the Cooperative Engagement Capability system through Fiscal Year 2007, with CG 68 and CG 71 becoming the first cruisers certified with the system 1996. CEC permits ships to fuse their sensor and weapons systems to cooperate against all air targets threatening the group. CG 70 and CG 73 deployed in 1999 with SM-2 Block IVA heat-seeking anti-ballistic-missile versions of the Standard Missile. CG 65 is trials ship for the associated Link 16 TADIL-J datalink and demonstrated an ability to provide targeting data to other ships and to a land-based Patriot SAM battery during a 1997 Arabian Gulf exercise. Beginning in 2000, the Phalanx CIWS mounts may be replaced by lightweight RAM SAM launchers, each with 11 missiles. Upgrades to the Aegis system software are improving the coordination of combat data. Further reported AEGIS baseline upgrades include Baseline 6, which updates the computers in older units, and Baseline 7, which changes the combat control information system from federated to fully distributed. 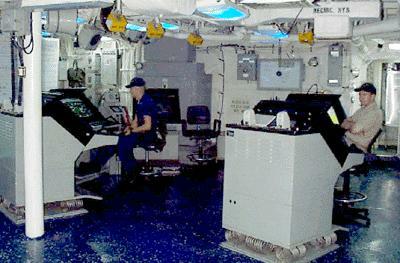 In 1996, CG 61 became the first Baseline 3 ship to upgrade to Baseline 3A, receiving the Baseline 5 Phase III computer program and equipment upgrade, with Joint Tactical Information Display System (JTIDS, Link 16 Mod. 5), the latest UYK-21 display system, and UYK-43 computers in place of UYK-7. CG 59-64 are to receive similar upgrades except that CG 59 and CG 64 may get UYQ-70 displays in place of UYK-21. 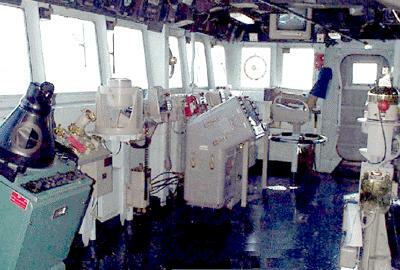 The first SQS-53D sonar update sets were ordered for ships of this class in 1996. In October 1995, the Naval Research Advisory Committee (NRAC) briefed reduced manning concepts applicable on U.S. Navy ships. Based on the NRAC findings, the Commander, Naval Sea Systems Command and the Commanding Officer, NSWC Carderock, stood up a team of volunteers in November 1995 to research labor and manpower saving ideas. 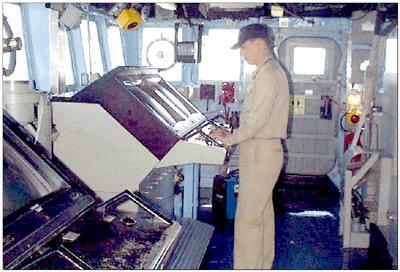 This Program, title Smart Ship, was endorsed by the CNO in February 1996. From the outset, the Smart Ship Program has used the USS YORKTOWN (CG 48) as the platform for demonstrating innovative technology aimed at reducing manning requirements and life cycle costs. The Smart Ship Program had over five dozen initiatives on board YORKTOWN, within the catagories of Combat Systems, Hull Mechanical & Electrical, Own Unit Support and Manpower Personnel Training & Assessment. These initiatives continue to support the Smart Ship Charter - reduction of manning and related cost savings on present and future U.S. Navy Surface Ships. The methodology that has been developed by the Smart Ship Program for reviewing, testing, evaluating and reporting new ideas would continue in the outyears. The Program has also begun to leverage the success of YORKTOWN onto other AEGIS Cruisers through the Integrated Ship Controls (ISC) Program. It is clear that reduced manning is an essential element, if not the essential element, in affording the Navy of the future. The Aegis Cruiser force would remain on the front line into the 21st century, with upgrades as part of the Cruiser Conversion program. This mid-life refurbishment program for 22 ships extends their service life to 40 years. The Cruiser Conversion program would add the Area Air Defense Commander (AADC) Module (for Baseline 3 & 4 only), Area TBMD, two 5 inch 62 caliber Land Attack Gun upgrade, and Standard Missile-4 land attack missile (LASM). This conversion program would ensure the relevance of these ships in the future, and is vital for the Navy to meet the future warfighting requirements in Land Attack. Without this program, their future is tenuous. The Navy funded a plan to enhance and extend the capability of 12 of the 27 existing CG 47 class ships over the FY1999-2003 FYDP, with the initial unit funded in FY 2001. The FY 1999 budget request included $20.0 million in RDT&E for a mid-life upgrade of these ships to enhance their combat systems capability for the new Theater Ballistic Missile Defense mission area. Other enhanced combat capabilities envisioned for these highly capable ships include a new Area Air Defense Commander suite and upgraded land attack capability. It is important to note that the first five AEGIS cruisers (CG47 - CG51) are not part of the Cruiser Conversion program because of affordability. This has raised concerns that if the Navy is unable to afford to eventually include these five ships, they would not ever be modernized and would be targets for early decommissioning. One modernization plan for surface combatants would have decommissioned some ships early, but would have boosted the firepower of the remaining force by adding the Vertical Launch System (VLS). The five TICONDEROGA-class cruisers in the fleet without VLS would receive the system: USS TICONDEROGA (CG 47), USS YORKTOWN (CG 48), USS VINCENNES (CG 49), USS VALLEY FORCE (CG 50) and USS THOMAS GATES (CG 51). Although under consideration in the 1990s, this option has apparently been discarded. The Surface Navy developed a modernization plan for the CG 47 TICONDEROGA Class Cruisers, with procurement programmed to begin in FY02 and the first install scheduled for 2004. In the program, the modernized combat system would address the growing theater ballistic missile threat by incorporation of area and theater-wide TBMD capability. Additionally, introduction of two five inch 62 caliber guns with extended range guided munitions in 22 of these ships would help meet the USMC requirements for fire support. They would continue to receive upgrades to their command and control suites to ensure they remain full participants in the joint battlespace. This conversion program takes advantage of the sizable investment ($22B) already made in these ships, and keeping them ready to meet the challenge over 40 years of service life. To integrate its air-defense network with the joint environment, the Navy fielded a prototype area air-defense commander (AADC) capability in the Aegis cruiser USS Shiloh (CG 67) in Spring 1999 and as part of the Cruiser Conversion Program . Using feedback from the operational community, the Navy would evolve a capable and robust command and control (C2) system that supports the AADC's requirements to plan and execute the air and missile defense mission well into the next century. This program, developed by the Johns Hopkins University Applied Physics Laboratory, ensures that the Navy's air-defense platforms remain relevant to the air- and missile-defense mission of the future. Once achieved, the Navy's new air defense systems would provide the AADC with the necessary authority to accomplish the TAMD mission because it allows him to plan and to direct tactical operations for air and missile defense forces at sea, ashore and in the air. In the Fall 1998 USS THOMAS S. GATES (CG 51) was scheduled as the first installation ship in the US Navy's Integrated Ship Controls (ISC) Program. This upgrade program would install innovative labor and cost savings initiatives on USS THOMAS S. GATES, USS TICONDEROGA (CG 47), USS VINCENNES (CG 49) and USS VALLEY FORGE (CG 50). Many of the technologies to be installed are the result of the initiatives proven sucessful on YORKTOWN. The upgrade program also includes options to install systems on the remaining 22 CG 47 Class AEGIS Cruisers. Modernization of the machinery control system for CG 47 Class ships is required in order to overcome impending obsolescence, reduce operating and support costs, and facilitate workload reductions. This would be accomplished with the installation of commercial off-the-shelf/non-developmental items (COTS/NDI). The FY2001 budget request included $28 million to fund the procurement of "Smartship" upgrades for five CG 47 Class cruisers in FY 2001. A total of $467 million spanning FY 1999 through FY 2005 is programmed for these "Smartship" improvements Fleet-wide, which would reduce manning and ease the maintenance burdens on our Sailors. By eliminating mundane tasks and allowing the crew to concentrate on high priority items, this technology is an enabler for reduced manning. Through automation, the number of personnel required to perform these tasks can be reduced. In 1996, CG 48 was selected as Atlantic Fleet "Smart Ship" trials platform for labor and cost savings experiments. The ship is testing some 800 different concepts including the use of off-the-shelf computers, the Sperry Marine integrated bridge, new paints, etc., and the crew is to be reduced by 50. The Smart Ship Project was initiated by an October 1995 brief from the Naval Research Advisory Committee (NRAC) panel on reduced manning to the Chief of Naval Operations. Their report stated that the major obstacle to reduced crew size and decreased life cycle costs aboard Navy ships was culture and tradition rather than the lack of proven technology and know-how. The challenge was to demonstrate in an operational ship that reductions in workload and crew requirements were possible while maintaining mission readiness and safety. The Commander, Naval Surface Force, US Atlantic Fleet (COMNAVSURFLANT) was designated as Executive Agent for the Smart Ship Project and nominated USS YORKTOWN (CG 48) as the ship in which to implement ideas to demonstrate the concept. Integrated Bridge System (IBS): automated piloting, ship's course and track analysis with radar and chart overlay, including collision avoidance. Integrated Condition Assessment System (ICAS): automated condition-based maintenance recorder for main propulsion and auxiliary equipment; digital information maintained on fiber optic LAN. Damage Control Quarters (DCQ): automated damage control management system providing information and communication throughout the ship on the fiber optic LAN. Machinery Control System (MCS): automated digital propulsion and electrical plant control using signals passed via the fiber optic LAN. Fuel Control System (FCS): automated digital control of ship's fuel transfer system. 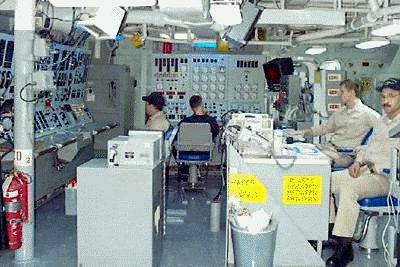 Wireless Internal Communication System (WICS): individual ship's company personal communications or near the ship. All approved Smart Ship initiatives were implemented aboard YORKTOWN prior to her deployment in December 1996. Huge chunks of the ship were torn up and thrown away and replaced by computer consoles and miles of fiber optic cable. A local area network was installed, bringing greater versatility in communications and training. Smart Ship Inovations allowed the bridge team to go from 13 personnel on watch at a time down to 3. Smart Ship inovations allowed the Engineering team more flexablility in the operation of the engineering plant. It has also allowed the engineering Central Control Station to go from 11 people on watch at one time down to 4. With all policy and procedure, technology, and maintenance initiatives implemented, crew reductions enabled by the decrease in workload were 44 enlisted personnel and 4 officers The Smart Ship Project demonstrated that shipboard workload reductions are possible while maintaining combat readiness and safety with significant net positive return on investment. Expenditures on available technology and implementation of policy and procedure changes make crew size reductions achievable. The required expenditures for such changes are offset by large potential savings, both shipboard and ashore, and in operations and maintenance costs aboard ship. Technology, taken as a single package as installed in YORKTOWN, returns the investment in seventeen years. However, some of the individual technologies demonstrate a more positive return-on-investment. In 2006, cruisers would begin the process of being upgraded through the Cruiser Modernization program. Cruiser Modernization is a cost effective means to sustain or increase force structure and deploy new vital capabilities sooner. All cruisers in the fleet with the exception of CGs 47-51, would eventually go through modernization. Cruiser Modernization would improve warfighting capability by providing systems upgrades including Cooperative Engagement Capability and the AN/SQQ-89A(V)15 with Multi-Function Towed Array. Cruiser Modernization also provides a viable platform for future Ballistic Missile Defense missions. A comprehensive service life extension work package, which includes the All-Electric Modification, SMARTSHIP upgrades, hull, mechanical, and electrical system upgrades, and a Type Commanders maintenance work-package, is included in modernization. CG modernization began in FY 2006. The first ship scheduled to undergo modernization was USS Cape St. George (CG 71). The remaining 21 baseline 2, 3 and 4 cruisers had varying capabilities. The cruiser conversion program would result in all 22 ships having a common warfighting baseline. Improvements include quality of life initiatives, better weapon systems, SmartShip upgrades, remote monitoring capabilities, force protection upgrades, optimal manning, open architecture, and many other improvements. The FY2015 budget request includes money to lay up some cruisers, placing 11 cruisers on reduced operating status. They would be in the yard, but they won't be manned. They won't be operational, but they would be modernized and their life would be extended. So later on, as the cruisers that remain operating get old or need to introduce new modernizations, the Navy could swap one out and take from the yards and put it in service. It allows the Navy to keep a very capable ship longer, and it makes certain it's modern enough. Defense Secretary Chucke Hagel said in a 24 February 2014 briefing: "In order to help keep its ship inventory ready and modern under the president's plan, half of the Navy's cruiser fleet -- or 11 ships -- would be laid up and placed in reduced operating status while they are modernized and eventually returned to service with greater capability and a longer lifespan. This approach enables us over the long term to sustain and modernize our fleet of cruisers, which are the most capable ships for controlling the air defense of a carrier strike group." No more than six cruisers can be involved in modernization at any one time. It’s known as the “2-4-6” plan, and during their time in port, the ships receive hull, mechanical, and electrical improvements, as well as combat systems modernization. And as an added benefit, it saves taxpayers money. Even with the cost of the upgrades, keeping cruisers anchored is far cheaper than having them in operation. But the House Armed Services Committee’s Seapower and Projection Forces subcommittee proposed new legislation in April 2015 which would cut down on that four year period, reducing it to two. This plan is known as "2-2-6." If the new plan passed, it could have major cost effects on a US military already looking for ways to cut its budget. "The Navy’s original cruiser phased modernization plan would have saved approximately $4.5 billion over the entire program. Under the current 2-4-6 plan mandated by Congress, those savings are $300-$400 million…" Chief of Naval Operations Adm. Jonathan Greenert wrote in a letter to the HASC. "The proposed 2-2-6 language would eliminate all savings, as a two-year period does not support crew reduction." But cost means little when you’re concerned about the floating bear. According to Representative Randy Forbes, chairman of the subcommittee, the shortening of the modernization period is necessary to respond to combatant commanders’ demand for ballistic missile defense capabilities in the face of perceived Russian aggression. "The Navy’s original cruiser plan would have accomplished one thing, removing a significant portion of the Navy’s ballistic missile defense capability from the fleet at the same time the demand for those capabilities is growing exponentially," Forbes said. Greenert also noted other problems with the 2-2-6 proposal. If passed, it could threaten the Navy’s long-term plans to ensure the longevity of its cruiser fleet. "Under the Navy’s original PB-15 plan, the final CG [cruiser] retirement would have occurred in 204, at a significantly reduced cost to the Navy," he said in a written testimony to Congress last month. The 2-2-6 plan would force those cruisers to retire in 2035, which could cause a significant military spending crisis when the Navy is forced to prematurely rebuild its cruiser fleet. The CG Phased Modernization Program is designed to balance the Navy's long-term requirement for a carrier strike group air defense commander (ADC) platform and its future shipbuilding requirements. The modernization process includes major upgrades, including the Aegis weapon system with naval integrated fire control-counter air (NIFC-CA) capability, SPQ-9B multipurpose radar, electro-optical sight system, AN/SQQ-89A(V)-15 anti-submarine warfare (ASW) suite with multi-function towed array (MFTA) and significant hull mechanical and electrical (HM&E) upgrades. Upon completion of the modernization, the ships would have the most modern and capable combat system available, and an extended life from 35 to 44 years. Cruiser modernization ensures long-term capability and capacity for purpose-built Air Defense Commander (ADC) platforms. Of the 22 total cruisers, 11 recently modernized CGs would perform the ADC function for deploying Carrier Strike Groups while the Navy modernizes the other 11 ships. As these are completed, they would replace the first 11 on a one-for-one basis as each older ship reaches the end of its service life (35 years) starting in FY20. The modernization schedule commenced in FY15 on a 2-4-6 schedule in accordance with Congressional direction: two cruisers per year for a long-term phase modernization, for a period no longer than four years, and no greater than six ships in modernization at any given time. The Budget supports CG Modernization and proposes a plan that would save $3 billion over the FYDP by inducting the remaining cruisers into modernization following their current planned operational deployments. This differred from the initial plan in that the Navy would put a total of four CGs in phased modernization in FY17. This request did not align with previous Congressional direction, but the Navy believed it was the best way to honor operational demands while preparing for future requirements. In 2015 Congress reached a compromise between the Navy’s original plan to retire 11 aging cruisers and the desire of Congressional hawks to modernize all 11. Under this plan, the Navy would take two cruisers offline each year for modernization, with the modernization period not to exceed four years, and no more than six cruisers to be thus sidelined at any given time — the 2/4/6 plan. In 2015 the House proposed accelerating to a two-year modernization period — 2/2/6 — but at the end of the conference with the Senate, 2-4-6 was still the plan. In 2016 the Navy proposed taking seven cruisers out of service at once.